For the sutures - use silk thread if you have it, cotton if you don't. Do not use wool thread, wool fibers have little hooks on them that will embed themselves in skin if left alone too long, and they tend to absorb fluids - which makes them more prone to infection. Cotton's not better by a lot, but it's less prone to stretching (very uncomfortable to deal with when your fabric is skin.) less absorbent, and tends to pull out cleaner, especially if it's mercerized. Kendra tries to remember all the things her Mom told her about sutures as she dashes up the stairs and into the house. You needed smooth thread, she remembers that, nothing sticky, nothing with fibre or anything absorbent. The problem is, they're low on options. The people in this house weren't sewers and the thread they'd had was pretty crap, some old cotton thread from one of the houses two streets over, and an embroidery needle. She has backup needles, from the place they got the thread, but the thread itself… that's gone. Kendra tries not to think about the last few seconds of their jump. Everything inside her head slithers and jumps whenever she tries to think about it. It's like her memory keeps skipping. The sequence of events is tattered and patchy. And now they have no medical box, which means they also have no thread. She has an idea where she can get something threadlike but it's far from ideal. She heads into the kitchen for some other supplies, rather than the basement, to give herself time to think. 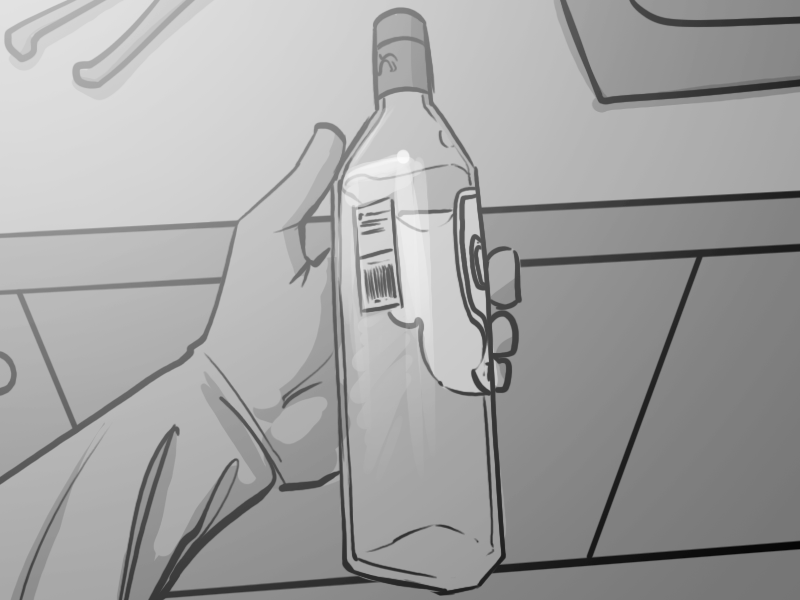 If you left all your rubbing alcohol or antibiotics, but for some reason have vodka or gin lying around, those are good alternatives to clean the wound. Thankfully she's completely out of it, so you don't have to worry about numbing her, but if she does start to wake up, alcohol has the added bonus of helping with pain. I wouldn't use beer or wine, or anything with a low alcohol content (like less than 20%? just guessing), though, since it'll probably do more harm than good since the alcohol content doesn't outweigh the other ingredients which would just contaminate it. Vodka's the best since it's typically the most distilled. The people who lived in this house weren't heavy drinkers, the wine they'd drank the previous evening had been in the basement of the house two doors down, but didn't everyone keep a bottle of something somewhere? She checks the fridge, pointlessly, for vodka. She's not thinking clearly, she already knows their meagre contents, and there's no alcohol in them. She starts opening cupboard doors. Aha! Back of the kitchen cupboard, under the sink. A nearly full bottle of rather bad looking whisky. So that's 'sterilization' solved, sort of. "pass out to the side or something" is so reassuring. I mean, that's yeah. Maybe you should find some cold water for her. You know, when you get the boiling water to scald your supplies. Taking the bottle of alcohol with her, she grabs a few things for Bina as well. She'll be dehydrated, on top of everything else. What she needs is a saline drip, mixed with some broad spectrum antibiotics, but bottled water will have to do for the moment. Elizabeth will be dehydrated too, worse, due to the blood loss, but she'll have to wait. Getting water into an unconscious person without an IV was possible, but time consuming. While grabbing the water from the fridge, she notices a pair of shears left from when she had Bina cutting lengths of wire for their improvised proximity detector. The thought jogs an idea loose and she stops for a second thinking. She could maybe tear some of the bed-sheets to pieces. They're polyester, not the best material, but if she frayed them enough she might be able to separate them into individual threads. No, it would take too long, and she'd have to boil them afterward. It's going to have to be the crappy plan. Thanky you xooxu and juddy555!